Mo Ibrahim is widely quoted as having said, “Cape Verde produces good people”; and Cape Verdean folklore says that when God finished creating the world, he dusted his hands and the crumbs that fell to the ocean became the Cape Verde islands situated on the West Coast of Africa. Whether you are a romantic or not, most people will agree – Cape Verde is special; and this is reflected in its spectacularly great food. 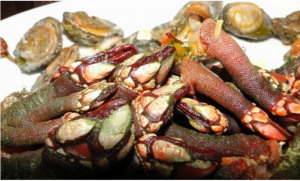 The country is blessed by its adjacency to the Atlantic ocean, which regularly gives up wonderful fruits of the sea such as garoupa, eels and tuna fish; and other exotic sea species such as octopus, shrimps, lobster and gooseneck barnacles to name but a few. What it does not have in land mass is more than made up for in its unrivalled access to the ‘Mar Azul’; a name made famous in the haunting morna songs of Cape Verdean siren Cesaria Evora. The startling ‘blue sea’ covers underwater craters connecting some of the islands and leading out to the ocean. I love food and cooking. As a huge fan of seafood, the taste for which was cultivated in my youth while living in Freetown, Sierra Leone (another place for spectacularly good seafood), I could hardly contain my excitement about what I anticipated would be a food odyssey. I intended to give my senses (and stomach) up to the unknown, and I was not disappointed. 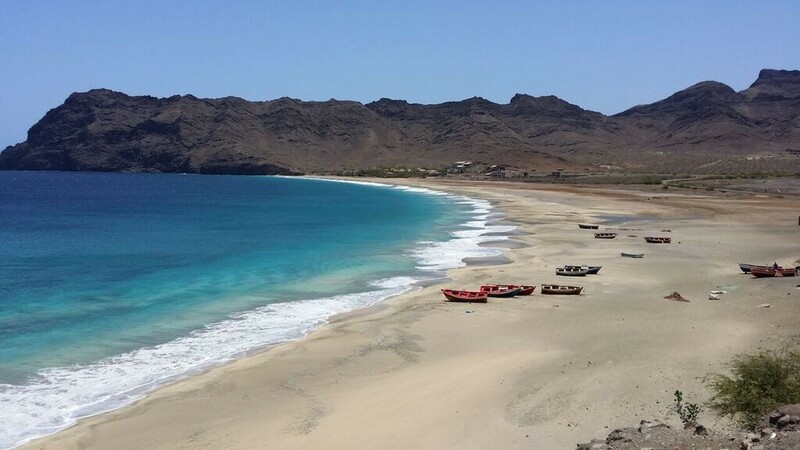 São Vicente is the second most populous of the archipelago of 12 islands forming Cape Verde, which were pushed up from the bed of the ocean from the volcanic terrain beneath. One island, Fogo – was volcanically active as recently as January 2015. There have also been droughts on other islands such as São Nicolau resulting in migration of people between the islands and as far afield as Senegal, Guinea-Bissau and the USA; taking with them local customs, variations of creole or crioulo the lingua franca, and food recipes. The population on islands like São Vicente, Santo Antão, Santiago and Sal are great melting pots resulting from this movement. Cape Verdeans of São Vicente are very hospitable and no strangers to making their guests welcome; so after the 6 hour journey which took my travelling companion Ade and I from London, UK, via Lisbon, Portugal to the capital Mindelo, we were greeted with a warm smile and an aperitif of the local tipple ‘ponche’ which is rightly held in high esteem. The sweet, alcoholic beverage is made of aged grogue and mel, resulting in a sweet, throat warming infusion, with echoes of a smooth brandy. Young grogue looks and tastes like gin. It’s hard not to have more than a couple of the dainty and prettily decorated glasses specifically used for serving this iconic beverage, which is also available in different flavours such as coconut. Breakfast at our hotel was a simple but wholesome affair, with an array of locally sourced fresh fruit, including papaya & bananas of which there are plenty on the island, but strangely no plantains! 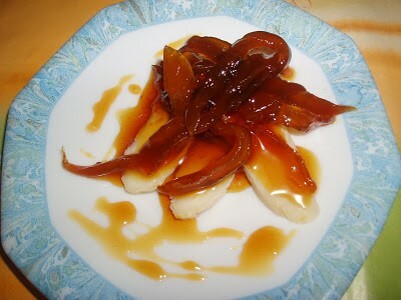 Bananas are used in various meals, and the dried fronds in decorative handcrafts and woven products. We were also served homemade yogurt which was creamy with just a hint of tang and a beautiful texture. I took to adding a generous helping of papaya jam to my yogurt, as it was the first time I had come across the preserve, made with the pulp and skin of green papaya and mel. Mel is the dark molasses like syrup pressed from sugar cane. It resembles honey which in Portuguese is mel, or miel in French, and is not from bees! Our bread was freshly baked, round and a light crust – with a choice of ham, or eggs (ovo) and local goat’s cheese (queijo). The round medallions of delicately flavoured goat’s cheese I was told is a specialty of Santo Antão, a sister island of São Vicente, which you can see on a clear day across the channel, and an hour away by ferry. It’s served not just at breakfast, but also as a starter or snack, in small cubes drizzled with olive oil and a mix of olives. It was not pungent and I couldn’t get enough of its creamy and slightly peppery taste. A typical Cape Verdean breakfast may consist of cachupa or manchup, a hearty maize and bean stew, sometimes leftover from the main meal the day before, fried up and served with egg it’s enough to set you up for a long day! Our daily sightseeing tours took us along the prominent fishing villages facing the Atlantic ocean from São Pedro, Bais das Gatas, to Calhau; the beauty of the blue sea provided a perfect backdrop for the beautifully coloured fishing boats, belying the harsh toll the profession can take on those who work on the sea, sometimes contending with rough weather or poor catches. The source of great food is fresh ingredients such as the plentiful fish (peixe). The main catch in season was ‘garoupa’ of the vast grouper family, a brightly coloured pink and orange variety with a sprinkling of blue dots and blue tipped fins. It’s also referred to as butter fish, here in the UK where it is well known in West Indian cuisine. I must have consumed at least one sizable garoupa each day, usually at Café Algarve, who grilled the delicately flavoured fish to perfection. Most of the catch is destined for the daily fish market, Mercado de Peixe, which is a hub of activity for locals and tourists alike. Many exotic species are on display for sale, the strangest for me being gooseneck barnacles. Not even the language barrier could disguise the fishmonger’s assertions delivered with a few winks, a knowing smile and broad laugh, that consumption of these critters would beneficial for… well I’ll leave that to your imagination. Suffice to say that the two gentlemen I observed gustily consuming a plate between them the following day, must have been in no doubt as to the veracity of these claims! 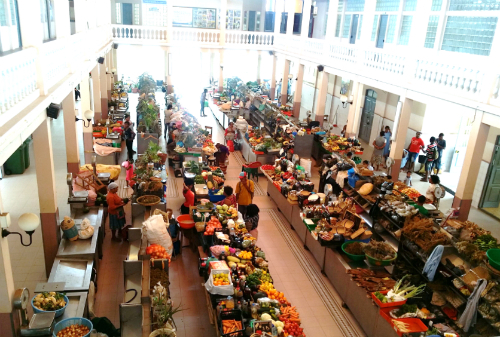 Further along in the main market, Mercado Municipal, all manner of fresh vegetables, produce and preserves are presented on long stalls in a pretty, clean and well organised market. We purchased some peri peri ground pepper, chilli and herb oil, mel, and ponche prepared by Wilhelmina and her daughter. She is just one of the many market vendors who willingly allowed us to sample their wares with a smile and patiently explained the ingredients to us. Wilhelmina said that she was no pharmacist, but she was proud of her wide array of herbs used in all manner of cures for ailments that could rival any conventional pharmacy! From our very first day, I noticed on display outside the small grocery stores and markets, a kaleidoscope of dried beans. I must have counted at least 5 varieties and became curious as to their use. 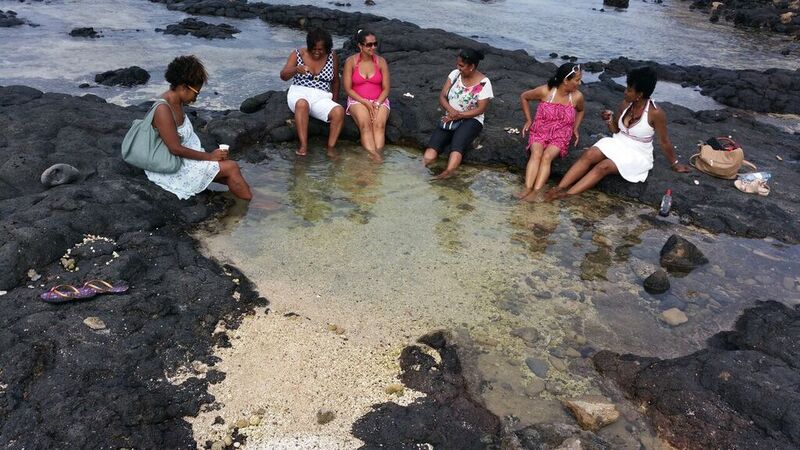 We had been directed by our hotel to ensure that we sampled the national dish of Cape Verde, cachupa. According to the guide book we consulted, the name may have originated from the word ‘ketchup’, brought into use by British colonisers; but that myth left some of the locals I questioned about it mystified! ‘Chez Loutcha’, owned and run by the inimitable Madam Loutcha is reputed to have some of the best cachupa in town. 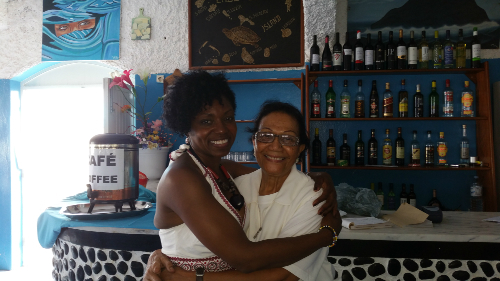 She inherited the business from her mother – the original Loutcha, and runs a popular guest house and restaurant in the centre of Mindelo, and a weekend restaurant and retreat of the same name in the seaside village of Calhau. The ambiance captures the cultural essence of Mindelo, with brightly coloured hand painted murals; small tables in an intimate setting, and the 5 piece Morna ensemble to serenade diners – the experience took on a spiritual feel, plus I solved the mystery of the beans! 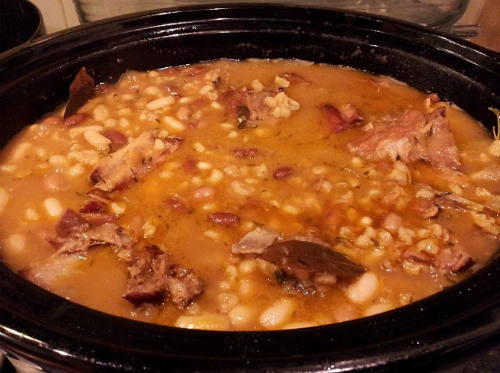 The cachupa is a slow cooked broth of spicy sausage, pork, lamb or fish; maize or hominy and a selection of legumes like kidney, lima or haricot beans. These are cooked together with onions and other herbs and spices in a specific order and over a slow fire to produce the flavoursome stew; and served with steamed vegetables such as cabbage, banana, cassava and sweet potatoes. Each island has its own variation. Having experienced a breath-taking tour along the Riberia Grande mountain range on the island of Santo Antão; we stopped for lunch on the edge of the crater valley. 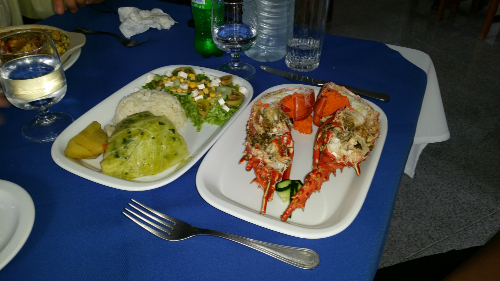 The picturesque village also served up one on the best meals I had on this holiday – the so far elusive lobster! It was worth the wait as, were the other seafood dishes on offer including a seafood paella, all cooked to perfection and spectacularly presented. Fresh steamed vegetables of carrots, green beans, cabbage, rice, bananas and potatoes accompanied each meal, with condiments such as peri peri pepper, chilli olive oil and sea salt from Sal. My odyssey wouldn’t be complete without sampling what in my opinion is the king of sea foods – lobster! No meal is complete without a great drink to wash down the brilliant food, and I discovered a light, refreshing pale beer called Strela. Of course there was always aged grogue and ponche in abundance. 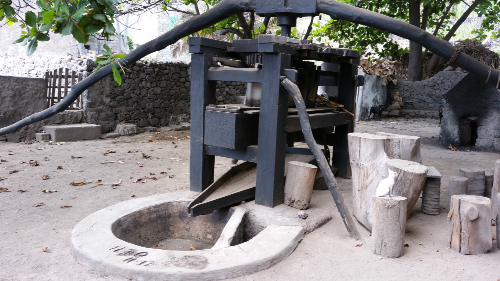 We visited a grogue factory by the coast in Santa Antão, where the original sugar cane presses or trapicho are still rotated by oxen the old way, with songs to serenade the oxen to tears – or so the legend goes! Sugar cane which grows plentifully in the fertile valley is fed between the cogs, and the sap is collected and distilled in vats then aged to produce grogue, the best of which is indistinguishable from the finest brandy. 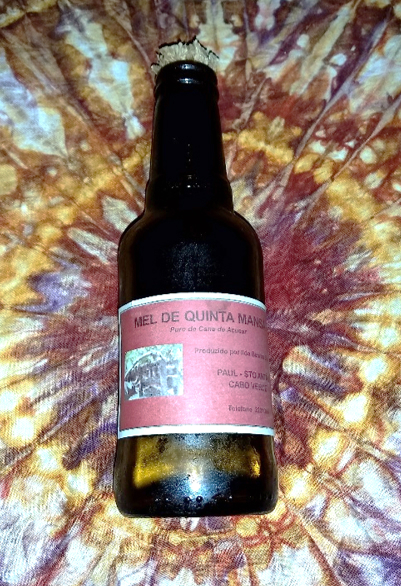 One should not forget the amazing home brewed ground coffee served throughout our trip available in decorated burlap sacks as souvenir gifts, and the fruity Portuguese red wine with a pleasing fruity nose. I couldn’t possibly describe in detail all our dining experiences, but suffice to say that in our 10 day stay, I enjoyed each and every one ! We discovered a wide variety of foods and styles; for example Benachin from nearby Senegal on the West African coast, and influences from further away – like pasta from Italy. 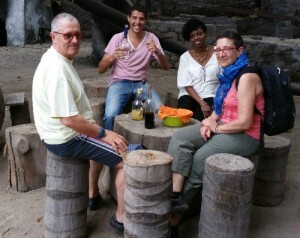 “Good food is sweeter when shared with good friends”, and so it was on this my odyssey; Ade, with whom I shared all my beautiful dining experiences and who tried everything bar the gooseneck barnacles and grogue, and ponche; Sabrina and Marina at our hotel Casa Colonial for the wonderful breakfasts, coffee and my first of many glasses of ponche; Elena and Giampaolo our new found friends for being part of some of our memorable culinary experiences, Yevgeny our guide for the lobster extravaganza on Santo Antão; Bernadette and Mum with whom we dined and danced at Chez Loutcha, Calhau, and finished off soaking our feet in the warm waters of a beach front rock pool putting our men to rights over a glass or three of grogue; Madam Loutcha, for her warmth, cachupa and the spectacular spread and variety of food at Calhau. Chez Loutcha – Cachupa; a sumptuous buffet of a wide variety of typical Cape Verdean, West African and Mediterranean food in Calhau. Sao Nicolao – we did not visit this island, but we made friends who reckon the best grogue comes from their island too!